This is an 18" x 24" black and white lithograph featuring the portraits of John A. Kelley (1907-2004), John J. Kelley (1930-2011), Amby Burfoot and Bill Rodgers, limited to an edition of 500. 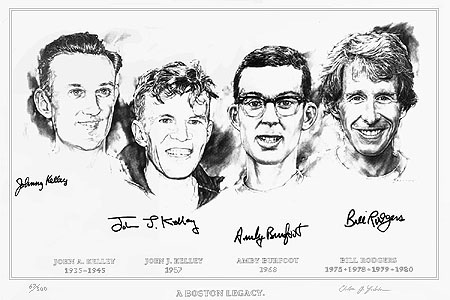 Each runner is pictured as they looked at the time of their first Boston victory. Each print has been autographed by all four runners and numbered and signed by the artist, Andrew Yelenak. The prints were autographed during the spring of 1994. The original drawing was reproduced as a duo tone lithograph, printed on 80# Mohawk Vellum acid-free cover stock. The price is $135.00 unframed, plus $6.00 shipping. Ordering Information. From friend to friend, coach to athlete, roommate to roommate, a legacy of running excellence was passed between these four marathoners. All went on to win at Boston. John A. Kelley, two time winner and competitor in 61 Boston Marathons, met the younger John J. Kelley due to their common name, and became life long friends. They competed in many races together. The night before the younger Kelley's Boston Marathon victory in 1957, he stayed at the elder Kelley's home. He was shielded from the press and well-wishers by Johnny, who fielded all phone calls and barred the door. John J.Kelley would become the U.S. National Marathon Champion 8 years in a row. John J. Kelley went on to coach Amby Burfoot as a student at Fitch High School in Groton, Connecticut during the early 1960s. He instilled the love of distance running in Amby that would lead to his Boston victory in 1968. Amby in turn, while attending Wesleyan University that year, shared his dormitory room with Bill Rodgers. Competing together on the cross-country team, Amby exposed Bill to the discipline and long miles of training necessary to become a marathon champion. Bill Rodgers would go on to be "King of the Roads" in the late '70's and '80's, winning Boston four times.